Hello readers! Or should I say, "Super readers!" after all the 'Super Why!' episodes my daughter has been watching...! Okay, back to the post, right. Well, I wanted to share with you all that I have some things commissioned at a new store in my city called Papa's Place. 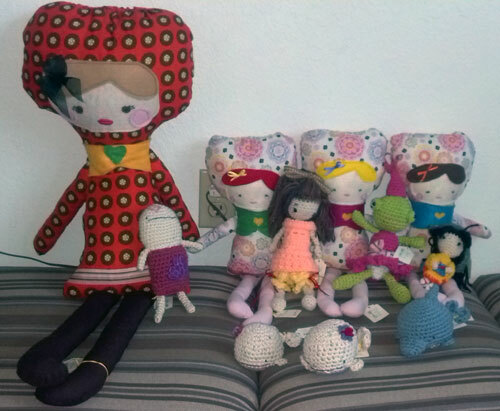 I crocheted a few things and made some dolls with my sewing machine using a pattern I purchased from Sarah Hansen. Her stuff is amazing! If you live in the area please check out the store after it opens on June 1st! The address is: 1419 Market St, Redding, CA 96001. The gps maps do not show directly where it is, but if you know where Chiropractor First is at, Papa's Place is across from it on the end corner facing the Los Gordos parking lot. It is a specialty handmade store with arts and crafts by local artisans. Here is a picture of the things I put in the store. So far this is my first commission opportunity. I look forward to see how it works out. I am hoping for more in the future. This will give me a good idea if it's something that will work with my family's schedule or not. Also I have something exciting to share with you, we will be moving to the bay area soon! I hope to write about it soon. Thanks for reading! I started a side blog for my toy creations. My plan is to transition all of the content here about it to Ewe Goober when my stuff starts getting popular. For now, I am keeping them under the name callmerae. Craft Fair Items: Very Cute Dolls! 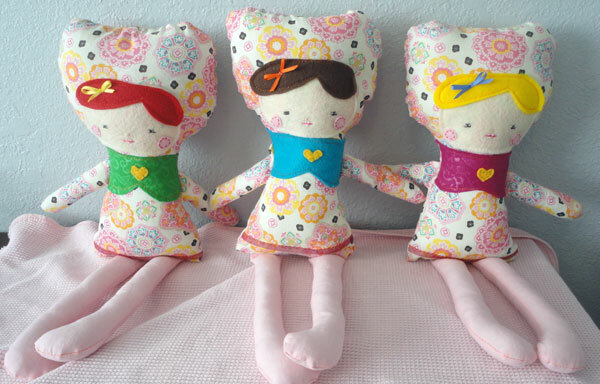 I just finished these three dolls I will be selling at the Bethel Church Bazaar on April 21st from 9am-4pm! These dolls are from a pattern by Dolls and Daydreams. The dolls are around 19" in length and made out of cotton fabric, felt and poly fiber-fill. Faces are hand sewn and embroidered. 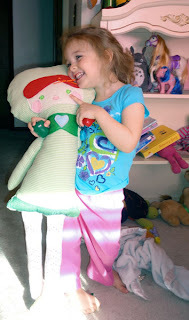 This is my first time sewing dolls like this and I learned so much from Sarah's pattern! I even made my own patterns and plan on working on them next. 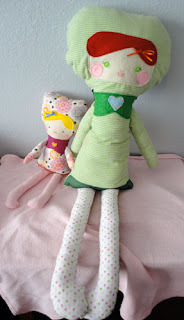 For my main attraction I made the dolly pattern three times as big and made my daughter a giant dolly! I used her baby blankets to make it. Flannel is so forgiving, especially to the inexperienced seamstress. Here is Kira with her giant doll. She loves it! I will have more details later on the craft bazaar and other things I will be selling. Thank you for reading about these! Life as a Mom Blog - Very Helpful! I am still learning how to balance my life as a mom with babies in the house. I found this blog on google and found it putting me in the right direction. I thought I'd share it for the mommies I know that may be going through the same thing.